This one day seminar will include the EarthHeart Meditation based on the principles of Nature that are mathematically described by the Fibonacci Numbers: 1, 1, 2, 3, 5, 8, 13, 21, 34, 55, 89, 144 etc. My presentation will also include the “Mathematics Of The Soul”. Venue: at the Serbian Cultural Centre, Greenslopes rd, Cairns. 1 DAY SEMINAR on THE SACRED GEOMETRY OF CRYSTALS. This one day seminar is designed to remember our connection to the 5 Platonic Solids and the Golden Mean Spiral (as revealed by the binary code of our first cell divisions of mitosis which express 4 cells as a Tetrahedron, 8 cells as a Cube, and then the Morula of 512 cells which is our primordial beginning in the shape of the Torus Dougnut). This is a fascinating subject that concludes withthe inner knowing that all Knowledge is within us. Many cultures have had a fascination for the Divine Proportion – Sacred Cut, Golden Mean, Sectio Aurealis. From the realms of nature to sacred architecture, the reason why we are so awe-struck when beholding the beauty of all creation is that it mirrors our own beauty, it is all a reflection of our own human bio-architecture. We are the living temple of creation ! You will leave this presentation enlightened, as Jain marries the ultimate feminine symbol of the fibonacci spiral with the ultimate male symbol of the Tetrahedron pyramid, and shows that when a light or a laser beam is shone upon this 3-D construct, its transduction to 2-D shadows is a written script or Language of Light that shows the origin of our Alpha Beta or English Language, the ‘Angles of the Angels’! Jain is an inspirational international lecturer of Sacred Geometry and Vedic Mathematics – a 2,500 year old Indian system of Mental Arithmetic. Author of 8 DVDs and 12 books, his work is admired around the world for its enlightening understandings of creation. His passion is to infuse children and adults with the Joy and Beauty of Numbers, and instill a reverence for the ancient hidden mysteries of our universe and the living mathematics of nature. >> He regularly conducts classes for teenage children called “Mathemagics” assisting them to recognise the beauty of mathematical proportions as seen in Nature and Architecture. Centre yourSelf via a One Breath Heart Based Mediation based on the Living Mathematics Of Nature. 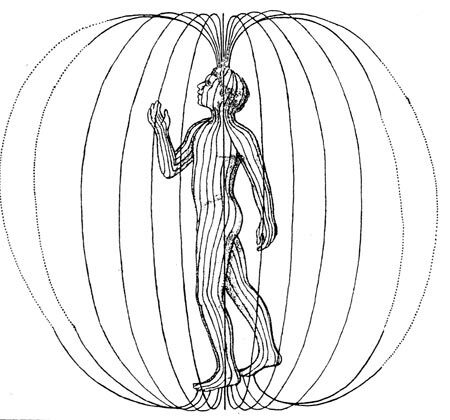 The EarthHeart Meditation is the ability to breathe into our Heart Centre, by visualizing that you are standing inside a giant doughnut-like toroidal field. As we breathe slowly into our Heart and breathe out, we are extending our auric field to encompass the room, the city, the planet. The secret of the EarthHeart Meditation is the unification of opposites based on the Counter-Rotating Fields as seen in nature and visible in the pine cone 8:13 code and the sunflower code of 21:34. The ancient science of counter-rotating fields is stored in our DNA since the Helix itself is based on 2 opposing spirals that store all biological memory and knows intelligently how to replicate itself. The EarthHeart Meditation is a unification of Heaven and Earth – when we breathe into our Heart, there is a meeting of the Celestial or the Above with the Terrestrial or the Below. Introductory Lecture at Windsor Spiritual Church, 8 Thorne st, from 7 to 9pm.